If the motorcycle zeitgeist is to be believed, 2015 is going to be the year of the Scrambler Ducati. It’s the bike that’s blowing up Instagram and finding fans even as the winter snow still rests on the ground. The appeal is pretty easy to understand. It’s a simple, compact, customizable, and best of all affordable little motorcycle that feels a lot more accessible than say a 200 hp Ducati Panigale 1299. Recently we got a sneak peak at the Scrambler thanks to a photo shoot we helped facilitate that featured the new Scrambler and a pair of custom vintage Ducatis for contrast. Since then we’ve had the Scrambler on-hand in our showroom so folks can get an early look at it (the vintage Ducatis are also around, if you know where to look). 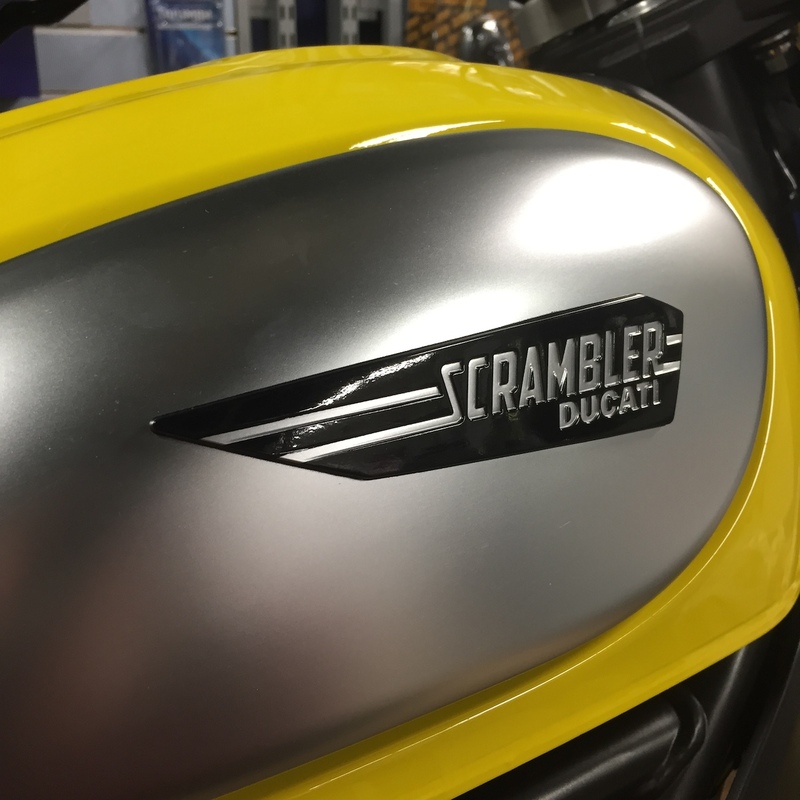 Funny thing is, for all the buzz around the new Scrambler, it’s really a known quantity. The motor is the air-cooled L-twin engine out of the previous midsize Monster. The Scrambler’s version of this engine is tuned to around 75 horsepower and the whole bike weighs in right around 400 lbs. That combo is pretty killer. Just throwing a leg over in the showroom, the Scrambler feels really light and approachable. It also looks terrific — grounded in a sort of general nostalgia, like a small town you once visited but can’t remember the name of. All in all, it comes across as a series of very good decisions on Ducati’s part. With the bike in hand, we couldn’t help but play with it a little once the photo shoot was done. With a small break of milder weather last week, I got a chance to climb aboard the Scrambler Ducati myself. It was just a quick blast around the neighborhood, but short as my ride was, it was enough to leave a big impression from this little motorcycle. Most of all, size and weight are definitely the Scrambler’s defining characteristic. It’s a true mamma bear bike — not too big and not too small. With nice open ergonomics, the Scrambler is able to accommodate a wide range of riders. The seat height is low, yet I found the distance between the pegs and the seat to be just right. The handlebars are upright, wide and at a comfortable height for both sitting and standing, I found. At 6’3″, most bikes aren’t immediately comfortable for me, yet the Scrambler was. Everything felt like it was right where it should be. Yet its smaller riders that should really be excited here. 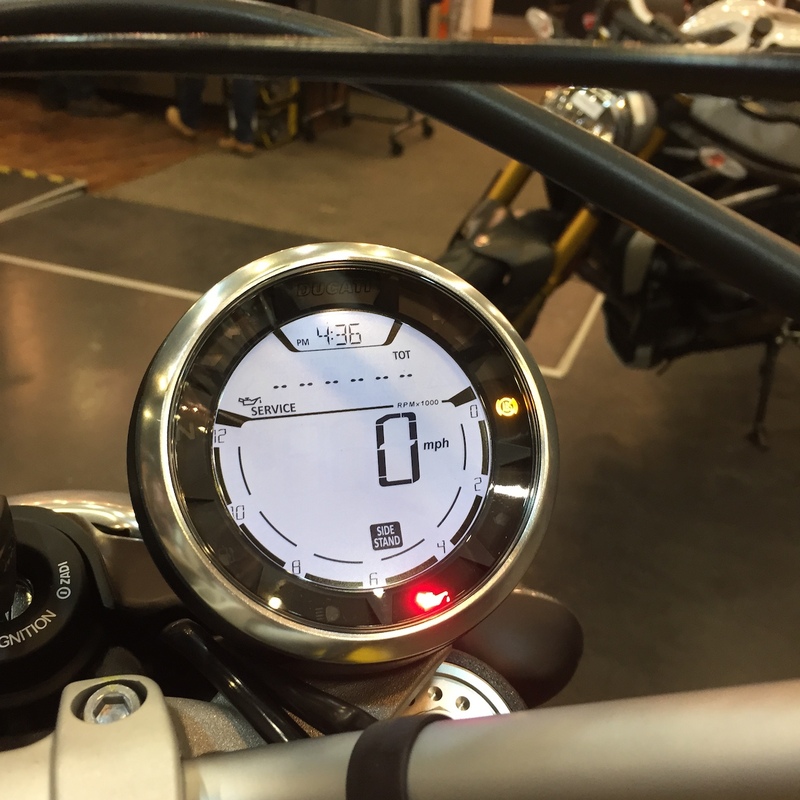 The 31″ seat height on the Scrambler is going to have a lot of shorter riders flat-footing it for the first time. As I sat there for the first time, taking in all the Scrambler’s little details and comfortable ergonomics, I could already tell Ducati are on to something here, and I hadn’t even cracked the throttle yet. Setting off away from Motoworks and into the neighborhood, the Scrambler just felt correct. It was exactly what I’d want it to be given the type of bike it is. It had tons of Ducati air-cooled engine character and the chassis felt every bit as light as advertised. The wide handlebars and low seat almost encourages you to stand up on the pegs. Make no mistake, this is no dual-sport bike, yet as I navigated the gravel and muddy bits of road construction all around Motoworks, the fat dual-purpose tires didn’t let me down. With each twist of the throttle, the Scrambler would gallop forward. The power output is predictable, but with the bike so light, that 75 hp feels like more. There’s a scrappy character to the motor that, for those who maybe haven’t ridden a Ducati before, is perhaps the Scrambler’s most charming aspect. It goads you on, raring to push forward and begging to show the front wheel some sky. My little test ride was short, but the impression the Scrambler left on me was big. Ducati have really got something here. It’s light. It’s simple. It looks terrific. Best of all, it’s starting around $8,000 new. One question that seems to be coming up a lot is would this make a great first bike? That’s a tricky question to answer. On the one hand, the Scrambler is light, neutral and affordable. On the other hand, it’s got a lot of power. This bike with about half its horsepower would be a perfect first motorcycle for someone just getting started, but at full power, it might be a bit of a handful. So if you’re a new rider, that’s a question you’ll have to answer for yourself. My personal advice would be to have at least a little bike experience under your belt and then hop on the Scrambler. It won’t take much. It’ll happily reward your experience and best of all, carry you off into the countryside for all kinds of fun adventures. I can’t wait to put a few hundred miles on one myself. Haven’t seen the Scrambler yet yourself? You’re in luck. This one is still on our showroom floor. Also, this coming weekend is the IMS and there will be ample opportunity there to throw a leg over a Scrambler at the Ducati booth. We’ll also be there helping man the Motoblot booth, so definitely stop by and say hello. 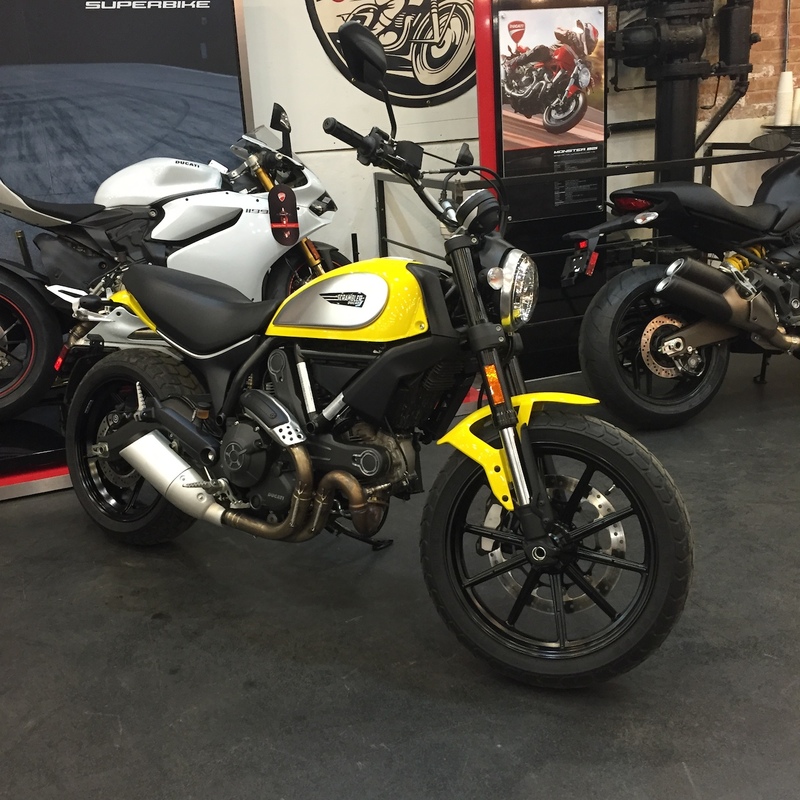 In addition, on February 21 Ducati is bringing all three of its new bikes for 2015, including the Scrambler, for a special preview event at the shop. Come out and see the Scrambler, the new Multistrada and the new Panigale 1299 before they otherwise become available. I know what you’re thinking though. What about test rides? We’ll be playing that by ear in terms of when we start seeing actual bikes arriving from Italy. Right now we’re expecting them in as early as April and we’ve got tentative plans for a Scrambler-specific demo event on the 25th of April, so save the date there and stay tuned for more details. 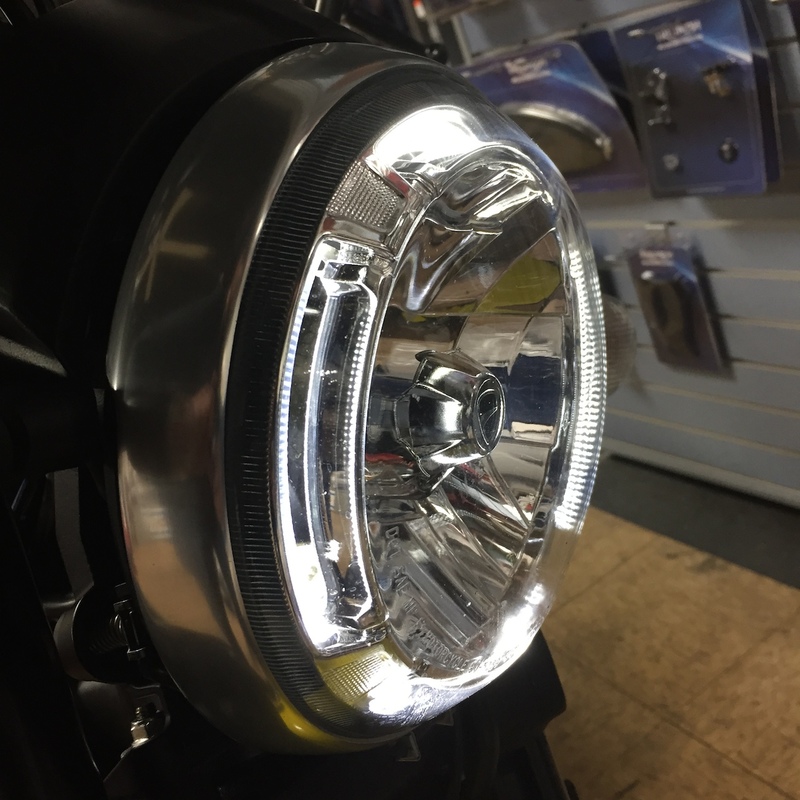 In the mean time, if you’re already onboard, give us a call and you can reserve your Scrambler with a deposit. Quite a few folks have done this already and with only so many bikes coming state-side this year, it’s a good idea to get onboard early if you’re thinking Scrambler for this year. Give us a call at (312) 738-4269 and we’ll get you taken care of.